Best Spring Sandals: Cute Orthopedic Sandal Selections -- with Arch Support! Best Spring Sandals: Cute Orthopedic Sandal Selections — with Arch Support! Now that the warmer weather is here, our patients say they are looking forward to busting out their cute spring and summer shoes — be it a strappy sandal, a wedge platform, ballerina flats, hiking sandals, or flip-flops. Unfortunately, most of the shoes on the market wreak real havoc on a person’s feet! Learn which ailments The Center for Podiatric Care and Sports Medicine regularly treats as a result of spring shoes — and which options make better shoe choices for people with foot pain. Looking for cute spring sandals that won’t hurt your feet? Our NY podiatrists can help! 1. Plantar fasciitis heel pain – The lack of arch support in a typical sandal can lead to small tears in the plantar fascia tendon that runs from your heel to the ball of your foot. 2. Neuropathy & neuromas – Repetitive stress from the lack of padding in your shoes can cause the nerves to become irritated and inflamed. You may feel a tingling sensation or as though there is always a “stone” beneath your foot. 3. Tendinitis – The repetitive motion of walking without sufficient padding and structure can cause your foot and ankle tendons to swell also. Eventually, the tissues connecting muscle to bone can become torn or severed. 4. Soft tissue injuries – Calluses, bruises, blisters, and cuts are probably the most common injuries from sandal wear. The straps often dig into the flesh over the course of the day, as the feet naturally swell. Also, sandals are worn without socks, so there is nothing protecting the material from chafing against the bare skin. If left unattended, these small injuries can turn into terrible infections. Generally speaking, there are a few things podiatrists say foot pain sufferers should look out for when selecting sandals. First and foremost, you want to find shoes with the most surface area — so think wider with a higher arch. Also, you want a stable sandal that offers wide, adjustable straps. Lastly, look for a sandal that offers cushioning by pressing down into the foot bed to see how long your finger indentation remains. We find certain brands are reliable sources of footwear that fit all of these criteria. 1. Birkenstock Gizeh – One blogger loves these shoes so much, she has three pairs of the exact same shoe! They offer just about every color of the rainbow, including the black patent (pictured below.) Men’s sandals are available in more neutral tones as well. Special features of this shoe include: shock absorbing soles, footbeds that enable even body weight distribution, and materials that mold to the natural shape of the foot. Blogger Alison Freer says she has three pairs of these beloved sandals. 2. FitFlop Cha Cha – Fit Flop has a lot of cute and comfortable sandals out this season. While we also liked the Aztek Chada, we chose to feature the Cha Cha due to its unique “Roaring 20s” design and versatility. You can dress it up with a sundress or dress it down with a pair of jeans. Orthopedic features include: an ergonomic midsole with “micro wobble board” shock absorption and underfoot pressure diffusion. Find a number of unique, stylish designs without sacrificing comfort from FitFlop. 3. Chaco Royal Sandal – A Spry Living Magazine favorite, the Chaco Royal sandal offers: a lightweight feel; ample arch support; a padded slip-resistant footbed; adjustable, comfortable straps; and durable EcoTread soles. In addition to the color shown, it also comes in blue, grey, and black styles. The Chaco Royal sandal may not look “orthopedic,” but it’s surprisingly comfortable and supportive. 4. Vionic With OrthaHeel Tide II – Looking for something simple that looks great with everything in your closet? The Tide II comes with comfortable webbing and leather with a padding lining to protect you from cuts, flexible midsole shock absorption, a durable tread, and a podiatrist-designed orthotic footbed with deep heel cups for support and stability. These sandals are recommended for orthotic wearers and people with flat feet or overpronation. Orthaheel shoes are podiatrist-designed for maximum support and comfort. 5. Teva Tirra – As far as hiking sandals go, we love what Teva has to offer. The black & grey Tirra sandal has a durable rubber outsole offering excellent traction, a shock-absorbent heel, a well-molded arch, and antimicrobial coating. 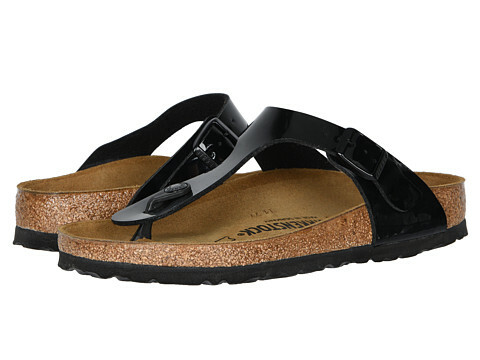 The Neota sandal is another excellent option if you prefer a more natural-looking brown orthopedic sandal. Bouldering Life Magazine lists these two sandals in their “Top 15 Best Hiking Sandals For Women.” Hiking Gear Guru is also a fan of Teva sandals. The Teva Tirra is a stylish option for spring and summer hiking on rugged terrain. In New York City, the board-certified podiatrists at The Center for Podiatric Care and Sports Medicine offer a wide range of treatment options for foot injuries caused by sandals. Minor injuries can be healed using specially-designed foot wraps, fast-healing injections, or custom orthoses. More substantial damage can be corrected through surgical means. The latest technology — such as foot lasers, shockwave therapy, and platelet-rich plasma injections — are all at our fingertips. We can also assess your gait and foot biomechanics to recommend fashionable footwear that best suits your unique feet. Contact us for an appointment today.